Let's say this now, and you'll see it repeated OFTEN..."Henna is NOT black." Real henna will ALWAYS be in the same color family of brown/red. It shows up differently on different parts of the body, and depends on a number of different factors as to the final color, but it is never black. Real natural henna is safe. Black "henna" is NOT safe. Real henna is not black. Why is black "henna" dangerous? Blisters caused by black "henna"
Black "henna" is henna mixed with chemicals that are NOT safe on or in the human body. Sometimes it contains no henna at all. Black "henna" is mixed with paraphenylenediamine or PPD. It often also contains ammonia, benzene, gasoline, turpentine, and/or kerosene, none of which should ever be put on the skin or in the body. The big problem with "black henna" is that sometimes people don't have a physical reaction that you can see right away, and they therefore think it's safe to use. It's not. Ever. The liver cannot process PPD as a toxin as it should. This means PPD does not leave your system, instead it slowly builds up over time and with every encounter. We encounter PPD more than we think, though not in the massive quantities found in "black henna". PPD and PPD-like-chemicals can be found in nearly ever hair dye, the ink in pens, and also in dyes for clothing. Paraphenylenediamine was even named allergen of the year in 2006 by the ACDS. Just because you don't always see the horrible blisters and scaring that some people encounter with contact with PPD, does not mean PPD is not doing damage. Every exposure to PPD puts you at substantially more risk. "Once the body's immune system has triggered an allergic reaction to PPD, such as after having a black henna tattoo, further exposure can be fatal. 'If you then dye your hair, it could cause an acute reaction, which can make you go into anaphylactic shock,' said Dr Fatma Mostafa, a skin specialist at Al Rustom Medical Centre in Dubai." Have you ever read a home hair dye box? Do you recall all the warnings about not letting it touch the skin and about doing allergy tests every time you dye your hair? Those are all specifically for PPD. Paraphenylenediamine is legal to use in hair dye in quantities of 6% or less. This is legal in the USA, but in many European countries PPD has been banned as, even, hair dye. 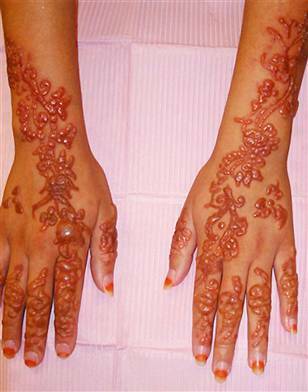 When used to make "black henna" PPD is normally in the range of 20-70%. Take a moment to think about this. It is considered dangerous enough at 6% or less to not be allowed on the skin and to require all kinds of safety warnings, yet when used as "black henna" it's being applied in substantially larger concentrations and being applied directly on the skin where it sits for an hour or more. You may have read about Pauley Perrette's (of NCSI) recent hair dye allergy? The reaction she had was to PPD in hair dye. Imagine if she were to have a "black henna" tattoo? People that show allergic signs to PPD sometimes must avoid other chemicals that are similar and this can mean no black clothing, no sunblock, some medications, and more. The UAE and other Middle Eastern countries have banned the use of PPD-laced henna and have started prosecuting violators. Why? The incredibly high rate of leukemia and other blood disorders and cancers in women caused by PPD. Henna is NOT black! There is no such thing as black henna powder, a black henna stone, or any other natural black henna. How do you know if the henna you are about to get is safe? What are the ingredients in this henna? The answer should be henna powder; a liquid such as water, lemon juice, or tea; and specific essential oils. Not all essential oils are safe for the skin, so the artist should tell which oils are in the henna (tea tree, lavender, cajeput, geranium, and sweet orange are all common and safe). If the artist does not know or is being shady or vague about the ingredients do not get henna from them. There is no "secret ingredient" in henna. so if they are claiming something of the sort, avoid them. How long should I keep the henna on my skin? The answer should be as long as possible (I tell people "ideally 4 hours or more"). If the answer is an hour, there is something mixed in the henna that shouldn't be. How long will the henna last? The henna will always start off orange and take a couple days to come up to full color. Generally you will have good color 5-10 days and the henna will be completely gone in 1-3 weeks. If the artist claims the color will be dark right away, do NOT let them henna you. No henna is dark immediately upon paste removal. If they say the color will be dark 3-4 weeks, do NOT let them henna you. Use Your Senses (Eyes and Nose)! The paste should be a greenish or brownish color, not jet black or bluish. As henna paste dries it oxidizes and that looks black, but the wet paste should be greenish or brownish. Smell the henna. It should smell like whatever oils the artist said is mixed in the henna. It should not smell like chemicals or something you'd use to wash out paintbrushes. Look for any stains on the artist. Most of the time, a henna artist will have henna on them somewhere. Look for red/brown stains. Often their hands will have bits of red-brown or orange. If you see black, don't get henna from them. Real henna is safe. Protect yourself by only using real natural henna! This is an excellent article! I will be sharing with my customers for sure! !